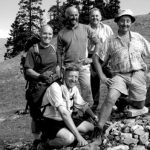 Over the last couple of years, my good friend, Tony Sharpe’s project reports have rightly concentrated on the work of the Nepal Trust (NT) and its post-earthquake recovery programme in Nepal. However, the NT also has a long-standing commitment to Primary Health Care and the recent field trip by board members and staff to Humla, enabled us to check on the status of some of our Health Posts and also the relatively newly-developed Birthing Centres. At the existing Health Post at Bargaun in south-east Humla, a new Birthing Centre extension was built and equipped, at the request of the local community, to provide a clean facility for the safe delivery of babies and the improved care of both mothers and babies. 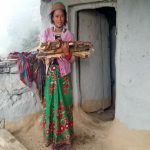 Previously, traditional deliveries had tended to be performed in less than hygienic conditions, contributing to unacceptably high neonatal and maternal mortality rates. At the Birthing Centre, Auxiliary Nurse Midwife, Nabina Lama, a local lady from Bargaun village, is trained to deliver antenatal care to prospective mothers, in addition to assisting with the safe delivery of the babies. Postnatal care is also given and then later, advice on such matters as general maternal and child health and family planning and contraception are also offered. Nabina told us that there had been seven deliveries at the Birthing Centre since its inception almost two years ago, all mothers and babies being fit and well with no complications. The seemingly low birth rate is perhaps a measure of success for the family planning service, although Nabina also mentioned that better-off families tended to opt for delivery in Simikot, the district HQ or even travel to Nepalganj or Kathmandu, so that the Birthing Centre perhaps tended to offer care for the more disadvantaged members of the community in Bargaun. No bad thing! Nabina’s post is fully funded by the Nepal Trust and we also provide a regular supply of medicines to the clinic. The Health Post sees an average of 4 – 5 patients a day, most complaining of symptoms of respiratory disease and upper gastrointestinal complaints such as heartburn and indigestion for which appropriate treatment can be given. 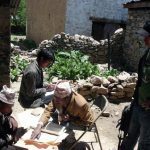 Many older patients have non-specific aches and pains and symptoms of general “wear and tear” reflecting the unavoidably harsh working and living conditions of their environment in this most impoverished and inaccessible part of the world. 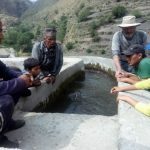 Please continue your generous support to enable us to continue to offer help and indeed hope, where it is most needed in the “hidden Himalayas”. Reported on in an earlier report a solar vaccination fridge, so important in these very remote areas for the safe delivery of vaccines, was safely transported by helicopter to our Yari Health Clinic and Birthing Centre. I am also very happy to report that our first two Little Doctors Health Education programmes for 2017 have now been completed at Mansarovar Secondary School and Bal Mandir Secondary School, both in Humla. Two more are about to start. As reported earlier this health education programme is having a huge impact on improving general health in these communities. Respitory and stomach disorders have seen a significant drop. Thank you to all our supporters, donors and followers for enabling the Nepal Trust to continue with our work. We can do nothing without you. Please pass on the good news to your friends and family.